Alanis Nadine Morissette (; born June 1, 1974) is a Canadian singer, songwriter, record producer, and actress. Known for her emotive mezzo-soprano voice, Morissette began her career in Canada in the early 1990s with two mildly successful dance-pop albums. 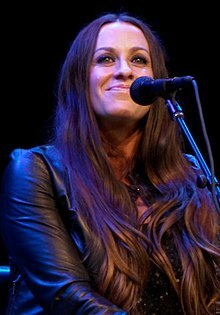 Afterwards, as part of a recording deal, she moved to Holmby Hills, Los Angeles and in 1995 released Jagged Little Pill, a more rock-oriented album which sold more than 33 million copies globally and is her most critically acclaimed work. Her follow-up album, Supposed Former Infatuation Junkie, was released in 1998. When people ask me who I'd want to have dinner with, dead or alive, I always say, 'John Lennon.' I just feel that he was an artist who was, in his own way, committed to wholeness and authenticity in a not dissimilar way that I am years later. I couldn't be touring unless my husband was on the road with me, taking care of our son while I'm onstage and doing interviews. Variety is important when it comes to exercise. I don't do anything that bores me to tears. I have a profound empathy for people who are in the public eye, whether they manifest it themselves or whether it happened by accident - it doesn't matter to me. I think there's a great misunderstanding of what it is to be famous. I think it's irresponsible when celebrities imply they're doing it all themselves. My son has aunties and uncles around all the time, and my husband is my hero. He's really full-on. I couldn't do it any other way. I've just always felt it's an incredibly empowering thing, particularly for young women, to capitalize on their coordination and their strength. It's a very empowering thing to feel strong in your body. When I'm off the road, my husband and I recharge our batteries. It's a day of deep rest and connection with the spiritual, and that can be anything - going for a walk in nature, being in silence, burning incense. I want to poke holes in the erroneous beliefs about what fame provides. It won't raise your self-esteem, it won't create profound connection, it's not going to heal your childhood traumas, it's only going to amplify them. You're going to be subject to a lot of criticism and praise, both of which are violent in their own ways. I find as an artist if I'm not expressed relatively consistently, I get really depressed. I've always been really opinionated, and mixed with being really open hearted, open to people shifting what I think all the time, but I like to speak with conviction. I don't want to offend people and I don't want to be mean, but social commentary and comedy for me are part and parcel. I think the greatest social activists are comedians. Ageism works in both directions. As a teenager in the public eye, people would talk condescendingly to me. When you get older there's this feeling that you have to start carving up your face and body. Right now I'm in the middle ground - I think women in their thirties are taken seriously. Peace of mind for five minutes, that's what I crave. I think it's child abuse to have someone in the public eye too young. Society basically values wealth and fame and power at the cost of well-being. In the case of a child, it's at the cost of someone's natural development. It's already hard enough to develop. Then I realized that secrecy is actually to the detriment of my own peace of mind and self, and that I could still sustain my belief in privacy and be authentic and transparent at the same time. It was a pretty revelatory moment, and there's been a liberating force that's come from it. I didn't want to be one of those women who wake up at 63 years old and realize they've missed the window of opportunity for marriage and children.